Hainan Rendez-Vous, China’s largest annual yacht show, has become a must-attend exhibition for the world’s marquee auto and high-end consumer brands. 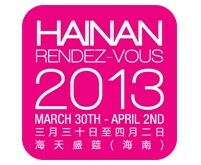 Hainan Rendez-Vous 2013 will be staged in Visun Royal Yacht Club / Visun Times Coast Marina on Mar.30 – April 2nd, 2013. Expect greater numbers of superyachts and huge megayachts, a more exciting and jam-packed program of entertainment and networking activities, and a fantastic new exhibition on the future of mobility design.